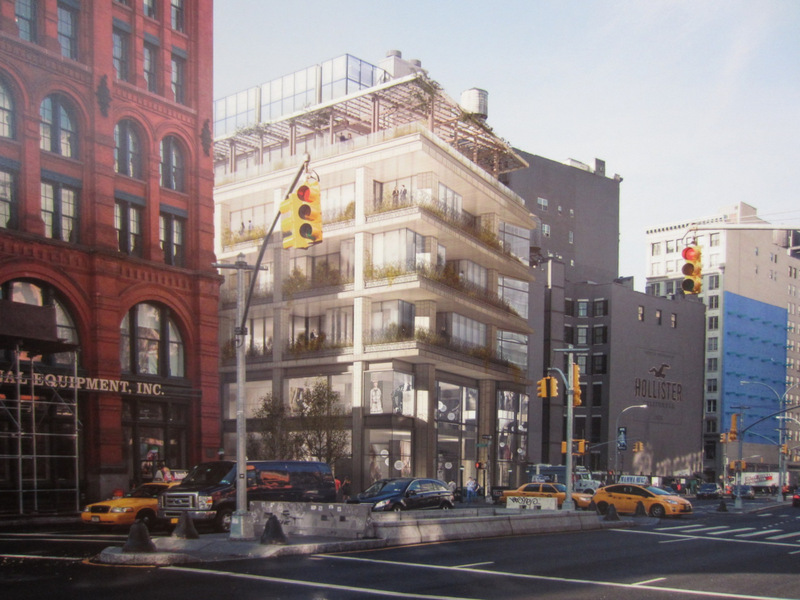 Rendering of development at 298-308 Lafayette Street, view from Houston Street toward the west. Image Credit: CookFox Architects. Commissioners embrace plan by CookFox Architects that would replace gas station, garage, bar and billboard. On April 9, 2013, the Landmarks Preservation Commission approved the issuance of a certificate of appropriateness for the construction of a new, seven-story building at 298-308 Lafayette Street. The three lots face the Puck Building and are at the corner of Lafayette and Houston Streets in the SoHo-Cast Iron Historic District Extension. The plan calls for the demolition of three existing structures that currently occupy the site. This includes the demolition of the Puck Fair bar, Houston Car Care, a BP gas station, and a billboard. The new building will be used for office and retail space. 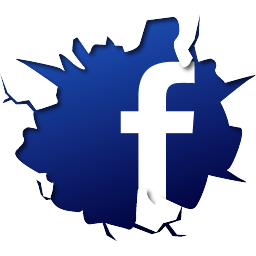 Developer Marcello Porcelli, President of LargaVista Companies, said the plan utilizes the site for “a higher and better use” than its current occupants. Porcelli said “we were extremely selective in choosing the right steward for this design process,” and that sustainability was a “guiding principle” of the project. Preservation Consultant Bill Higgins called the site a “gateway to SoHo,” and noted that all the buildings proposed for demolition were listed as “no style” in the district’s designation report. Higgins also stated that the evolution of architecture in the neighborhood had been a consistently greater ratio of glass to solid materials, but the interplay of the two was “crucial” to the district’s character. Richard Cook, partner at CookFox Architects, presented the plan for the new building at the “amazing site.” The architect would seek LEED Gold certification by the U.S. Green Building Council. Cook said that sustainability was a driving force in many aspects of the proposal, as well as a desire to “connect people to nature in a dense urban form.” He said he also wished to design a street wall building that would maintain views of, and not detract from, the architecture of the Puck Building, which was designated as an individual landmark in 1983. He also said the plan would continue the lineage of innovation in SoHo’s architecture. The building would be primarily done in floor-to-ceiling non-reflective glass, with a two-story base. The frame would be clad in limestone at the base and in terra-cotta at the upper floors, with stainless steel edge details. A trellis on the seventh floor would be constructed of rust-colored zinc, which would echo the red masonry of the Puck Building. The sixth and seventh stories of the building would be set back from the main facade, and the total height of the structure would be slightly less than that of the Puck Building. Species of plants indigenous to Manhattan would be planted on the roof and on the balconies on every floor above the second story. Blinds inside the building would be uniform to prevent the facade from becoming a “patchwork” from different interior curtains. The building would use structural elements like post-tension concrete floor plates, with plastic molds running through the slabs to minimize the amount carbon dioxide generated for the project. Kramer Levin attorney Valerie Campbell explained that the project would require three special permits from City Planning. The structure would require a variance for height and setback, because the applicants did not find the as-of-right building envelopes under the lots’ M1-5B zoning appropriate for the site, though the overall floor area will be the same as if the project were built as-of-right. The other special permits would be for the modification of use regulations, to allow large retail establishments below the second floor. Rendering of development at 298-308 Lafayette Street, view from Houston Street toward the east. Image Courtesy: CookFox Architects. Rick Bell, Executive Director of the New York Chapter of the American Institute of Architects, testified that the “exemplary” project served to “map a future of reduced energy efficiency,” and had “citywide ramifications” as an example of transit-oriented development. 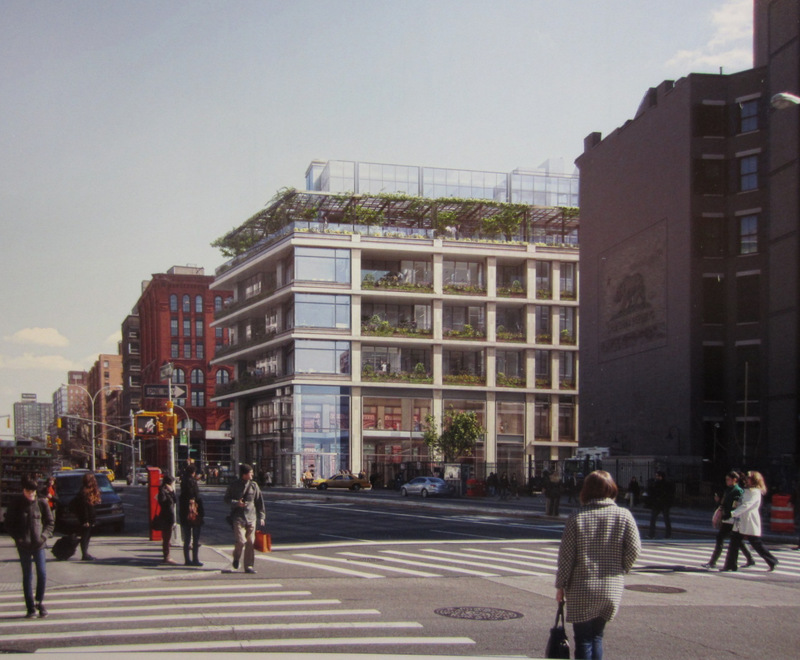 A representative of the U.S. Green Building Council similarly praised the “beautifully appropriate design,” and said that the building’s “day-lit spaces, highly filtered fresh air, and immediate access to landscaped spaces are qualities that support the health, well-being, and productivity of its users.” A representative of Manhattan Community Board 2 recommended approval of the proposal, stating that the design would not set a precedent for development design in SoHo, given the unique qualities of the site. A member of the Broadway Residents Coalition also spoke in favor of the plan. Chair Robert B. Tierney read a letter into the record from Assembly Member Deborah Glick, who said the proposal would be “a welcome addition to replace the gas station,” and that the project respected community concerns. Chair Tierney commented that he found the proposal to vindicate the inclusion of the site in the historic district, and led a unanimous vote to issue a certificate of appropriateness for the project. LPC: 298-308 Lafayette Street, Manhattan (14-1612) (April 9, 2013) (Architect: CookFox Architects).